Beige version: set of 3 Bobby pins, hair pins made with off-white Milliner color ribbon, combined with a Pearl imitation Pearl heart. The diameter is between 4 and 7 cm. 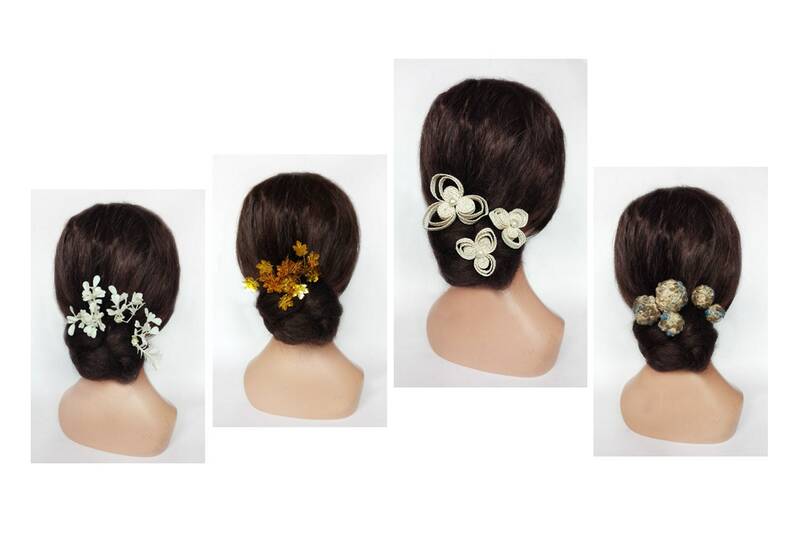 Minimalist-inspired Japanese style, these hair accessories accessoiriseront elegantly your hair. An alternative to the hat for any ceremony that is sure to go unnoticed. Gray version: bouquet of 2 hair pins made with a blue, gray and beige wool blend. The diameter is 5 and 4 cm. Minimalist boho hair accessory made unique. Floral interpretation, hair accessory is made with plastic glitter and ivory lace flowers. The work is on long 7 cm color Bobby pins gold. Version Gold: hair accessory made from a blend of glitter in the shape of leaf color gold mounted on a hair comb color metallic gold 2.5 cm. The diameter is 7/9 cm.